The University of Michigan Women of Color in the Academy Project (WOCAP) will present its 8th Annual Shirley Verrett Award to Dr. Tiffany Ng, Assistant Professor of Carillon and University Carillonist. 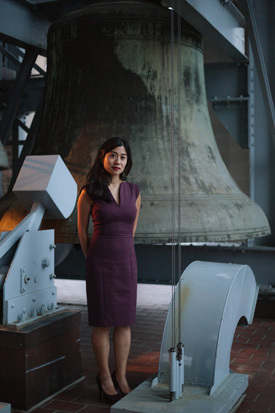 Dr. Ng is Assistant Professor of Carillon at the University of Michigan, Ann Arbor. She holds a doctorate in musicology and new media studies from the University of California, Berkeley, where her dissertation explored how two contemporaneous developments shaped each other: cold war technology and diplomacy, and the historicist revival of organ and carillon building in America and the Netherlands. Ng earned a master’s degree in organ from Eastman and an artist diploma from the Royal Carillon School in Belgium. Her concert career has taken her to festivals in fifteen countries in Europe, Asia, Australia, and North America, where she has premiered over forty acoustic and electroacoustic works. She also serves on the faculty of the North American Carillon School. A light reception will be held February 21 at 5:30 p.m. at Stamps Auditorium on North campus, followed by a ceremony with special performances beginning at 6:00 p.m. The event is free and open to the public. Registration is requested (2019shirleyverrett.eventbrite.com). The Shirley Verrett Award was created in 2011 by the Office of the Senior Vice Provost in honor of the late Shirley Verrett, a teacher who “would have walked the world over for her students.” The award is administered by WOCAP at CEW+, and recognizes a faculty member whose teaching, performance, scholarship or service supports the success of female students or faculty in the arts who come from diverse cultural and racial backgrounds.